Wrestling and boxing, both of religious significance in ancient Mesopotamia, were depicted on monuments dating from the first half of the third millennium BC. Battles involving heroes and demons were often portrayed. One wrestling bout involved the great Gilgamesh and his one-time opponent, Enkidu, who later became the hero's inseparable companion. 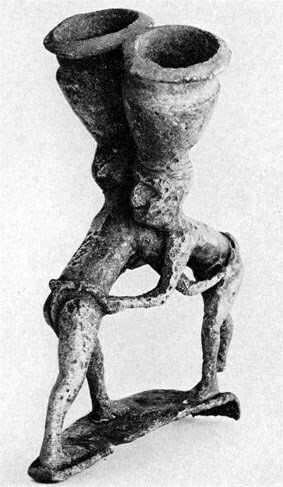 This bronze cast came from an early Dynastic level at Khafaje, east of Baghdad. Archeologists do not know why jugs were balanced on heads unless they constituted an extra hazard.